Since safety is one of the most important concerns, all required traffic control devices must be in place and installed properly. All traffic control devices should conform to the details shown on the plans or those indicated in the Texas Manual on Uniform Traffic Control Devices ( TMUTCD). For the operation to begin efficiently, the required barricades and signs should be in their proper locations no later than the day before the sealing begins. For strip/spot seal coat work, traffic control devices are normally placed on the day the work is performed. Generally, there should be one person who has full responsibility for traffic control. 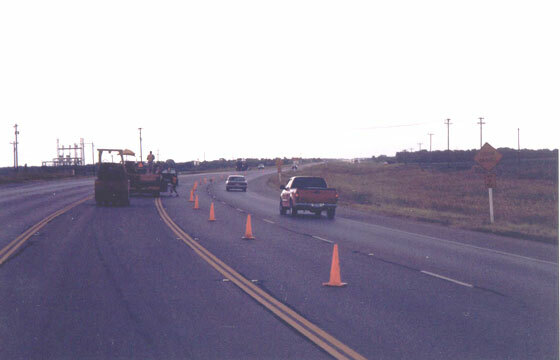 Traffic control includes erecting signs and barricades, placing traffic cones, flagging, and moving appropriate traffic control devices down the roadway as close as possible behind the seal coat equipment. Project signing should be completed before beginning any seal coat work. Signs should be covered until they become effective and removed when no longer needed. Positioned correctly so the devices do not pose a hazard to traffic. Cones are placed outside the operating path of the asphalt distributor and aggregate spreader. Figure 8-1. Traffic Cones in Position. When flaggers are required, each flagger must be properly trained or certified. Ensure the flagger is using proper equipment, correct signals, and can verbally explain the situation to vehicle operators. If there are flaggers at both ends of the project, ensure they have adequate communication devices and that the devices are used properly. The flaggers are vital to the safety of motorists in the work area. If the flaggers are not performing their duties properly, they must be corrected promptly. A pilot vehicle and radio equipped flaggers are often used for undivided roadways to improve the safety of the traveling public through a seal coat project. As a minimum, a pilot vehicle should have appropriate signing on the rear of the vehicle to guide the traveling public through the seal coat project. As work progresses down the roadway and as sections are opened to traffic, appropriate traffic control devices and flaggers should be repositioned. Once the flaggers and appropriate traffic control devices have been repositioned, they should be checked again to ensure proper placement and procedures. If the seal coat operation crosses intersections, traffic in these areas must be controlled. Care must be taken to prevent vehicles from crossing the asphalt before the aggregate is placed. This may require positioning other members of the traffic control crew at the intersection. Arrow boards are often used to move traffic into the adjacent lane. These are especially used on four-lane highways and where there is a large volume of high-speed traffic.